I learned about modifiers and bases from the naming convention for Crayola crayons. The crayon that was mostly green with a little yellow was “yellow green”. The one that was mostly yellow with a little green was “green yellow”. And thus the territory is called “American Samoa” rather than “Samoan America”. There are pockets of extreme Americanism here, but more than anything else, this place is Samoan. The only two countries I’ve ever really lived are America and Samoa, so coming to a place that claims to be their amalgam is pretty exciting. In the lead up to coming here, I had no idea what to expect. 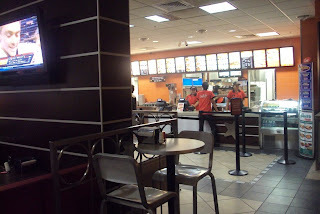 We hear all these stories about how there are all kinds of fast food in American Samoa, and about how the population’s a lot smaller and how the entire island was wiped out in the tsunami and blah blah blah. There’s a lot of information and misinformation out there, and so I’ve been pretty excited about coming to see it for myself. 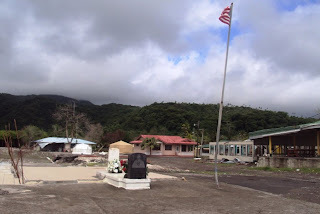 Really, except for the plane ride and the change in currency, American Samoa is pretty much identical to Samoa Samoa. English is slightly more prevalent, but Samoan still seems to be most peoples’ primary language. From what I’ve seen, it seems like most families live in similar fale-style houses with large bunches of extended family. But like I said, there are pockets of America here and there. 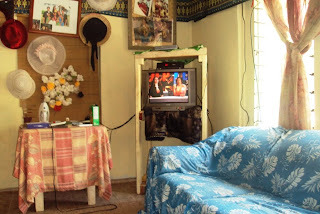 Cable TV has a lot more channels here; I watched 3 episode of Top Chef before Sarah’s friend came to pick me up for the LSAT. And students here are in “grades,” not “years,” and summer break coincides with the American summer. The Carl’s Jr. is lavish. Lavish. It’s huge and carpeted and has a soda dispenser in the dining area so you can refill your own drink. The booths have real cushions, and when I asked the girl where to find the ketchup, she went behind the counter and handed me a chilled squeeze bottle of ketchup from the refrigerator. And there are, of course, criss-cut fries, which even in American are delicious nuggets from heaven. They sell Vailima Special Export Brew here, which is more concentrated than the Vailima they sell in Samoa. I hear that to get the watered-down brew they sell in Samoa, they literally add water. They sell a lot of American beer here too though, but it just seems like a lot of Coors Light. Other than that, it’s the same old Samoa. The buses are even crazier than the ones in Samoa—they look like converted Honda Accords. And everybody drives 20 mph. But I guess either way it feels familiar. Watching Top Chef before the LSAT. Carl's Jr. after the LSAT. 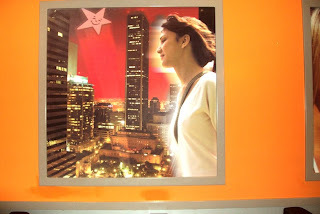 The Carl's Jr. had a Los Angeles theme, and this picture of the Aon building was on the wall. The Aon building is the 2nd tallest building in LA (Library Tower... errr... US Bank Tower is the tallest). The Aon building also happens to rent space to the Los Angeles Chamber Orchestra, where I interned in college. There was an employee who was all weirded out when I took this picture, but she actually interested when I told her I used to work there. 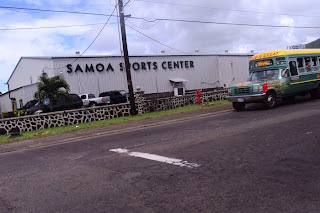 The Samoa Sports Center probably didn't use the en vogue Futura font to be all hip. But the font does make it look straight out of an (old) Ikea catalog or a Wes Anderson movie. This photo also provides an example of one of the buses. WHAT?? no comments for America Samoa?? LOL!! I still think you should look into Architecture...it's hours of culture, philosophy, art, math and hours and hours and hours at a computer doing design work that you love! just a thought!